I had the pleasure of spending my birthday this year at the beautiful Oregon Coast. 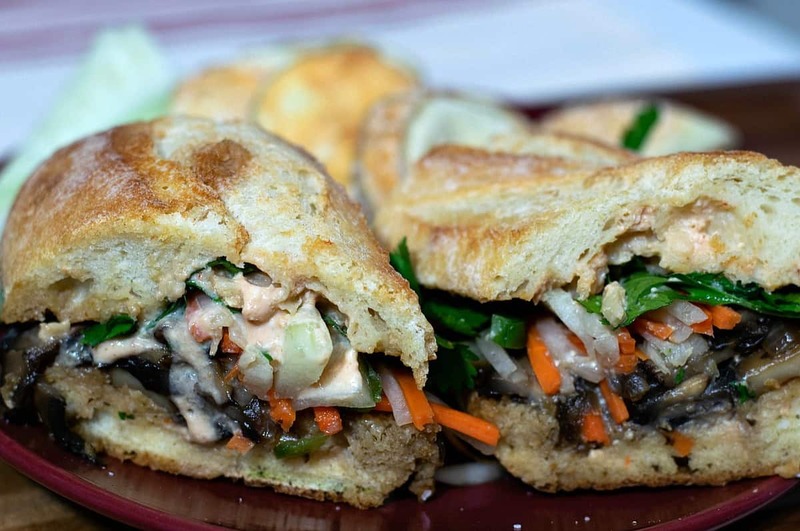 And for my dinner, I ordered this Vegan Banh Mi Sandwich from a local brewpub. It was so good I decided to recreate it myself! When I first saw it on the Menu, I was like, “What the heck is a Banh Mi“? Wow, was I pleasantly surprised! My sandwich was a crusty baguette, piled high with tasty mushrooms, and a pickled jicama and carrot slaw. They also used some kind of a spicy vegan mayo and added cilantro and jalapeno slices. No, it wasn’t hot and spicy, but it did have a nice zing to it. In fact, the whole time I was enjoying it I was already thinking about how I could make it at home. So first of all, this is a Vietnamese Sandwich. In fact, Banh Mi (pronounced bon-me) literally translates to ‘bread’. So it’s a traditional breakfast type sandwich, usually filled with some sort of pork and then topped with pickled daikon, carrot, cucumber, and cilantro. For my Vegan version, I decided to copy my brewpub buddies from Pelican Brewing in Cannon Beach, OR and use Portabello Mushrooms. Since the bread is important I went with an oil-free French Baguette I found at Whole Foods. I then julienned some Daikon Radish (available now in many grocery stores) and carrots and soaked them in Rice Vinegar to quickly ‘pickle’ them. At first, I thought the sauce was an aioli but then realized an aioli is usually made with oil so I went with a homemade mayo instead. I used silken Tofu and a little seasoning to make it into a mayo, then added some oil-free Hoisin Sauce and a heaping tablespoon of Sriracha to get those Asian flavors I really wanted. Perfect! All the different textures and flavors work very well together to make this a REALLY GOOD sandwich! So we’ll tackle this one step at a time. All that’s left is assembling this bad boy and enjoying that very first bite! I used my ever-intimidating Mandolin Slicer to julienne 2 carrots and a maybe a 4″ piece of Daikon Radish. Peel both the carrots and the radish first, and then carefully……push them through the mandolin to shred them. Daikon Radish is available in a LOT of grocery stores now, but maybe it’s just a west coast thing? If you can’t find them in your produce section, look for Jicama instead. Jicama is another white crunchy vegetable that is now in many produce sections. They’re kind of like Mexican Turnips. And if you can’t find either, regular radish will work fine. You’ll want about 1 cup each of shredded carrot and daikon. Place the shreds into a glass bowl and add 2/3 cup Rice Vinegar (Apple Cider Vinegar will work too) and 1/3 cup hot water. Mix and set aside. Note: Be sure and drain before using. While the veggies are pickling, let’s make the mayo. You’re going to need some Silken Tofu as it makes the best, creamy mayo. You will NOT need an entire 12oz or 16oz package, so I cut mine in half and froze half for a future recipe. Tofu freezes well. Place the other half of the Tofu in your blender and add 1 Tbs Lemon Juice, 1 tsp Apple Cider Vinegar, 1/4 tsp Salt, and 1 crushed garlic clove. This is a basic mayo recipe. Blend until smooth and adjust any seasoning if needed. TO that mayo, I added 2 tsp Hoisin Sauce. The brand SAN-J has an oil-free and gluten-free Hoisin Sauce I picked up at Whole Foods. And finally, add a little Sriracha for some kick. I used a heaping tablespoon, but you might like it a little tamer. Adjust to your own taste. Again blend until nice and smooth, scraping down the sides as necessary, and then scrape out into a small bowl and set inside your fridge for now. You should end up with about 3/4 cup of mayo. And finally, the ‘meat’ of our sandwich. For our marinade, whisk together 1/4 cup Low Sodium Soy Sauce, 2 Tbs Maple Syrup, and 1/2 tsp Liquid Smoke. Set aside. Saute about 1/4 of an onion in a tablespoon or two of water or veg broth until softened. Then add 16 oz of sliced Portobello Mushrooms. Cook until they begin to soften and release their own juices, then stir in the marinade. Let that simmer, stirring occasionally, until most of the liquid has cooked off and evaporated. 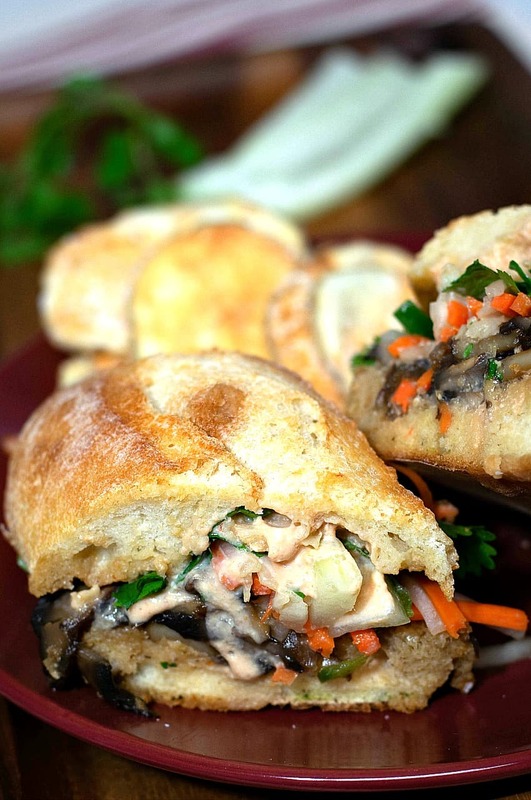 Since this Vegan Banh Mi literally translates into ‘bread’ – what we assemble our sandwich on is kind of important. For those following a strictly oil-free diet, I was able to find oil-free French Baguettes at my local Whole Foods. If that is not an option, I’m sure Dave’s Killer Bread or Ezekiel Bread will work just fine.. But in all honesty? A crusty baguette really makes this sandwich. I cut mine in half, slathered on some mayo on both halves, and then lightly toasted them using my toaster oven at 350 degrees for about 5 minutes. Then you just pile on the mushrooms on one half, and some of that slaw on the other. To garnish this awesome sandwich, you really should try some sliced cucumbers and fresh cilantro. And if you can handle it……some freshly sliced jalapeno as well. You get the savory ‘meat’ from the mushrooms, the crunchy tang from the slaw, and that spicy Asian kick from the mayo, PLUS the flavors of the garnish. Man – what a great Sandwich! Be sure and leave a comment if you enjoyed this as much as I did! 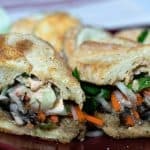 For my birthday this year, I ordered this Vegan Banh Mi Sandwich from a local beachfront brewpub. It was so good I decided to recreate it myself! Place veggies in a glass bowl and add vinegar and water. Stir occasionally and set aside. Previous Post: « What’s Wrong With Oil? It sounds very good, but I did not see onion in the recipe ingredients. Looks good, Chuck. 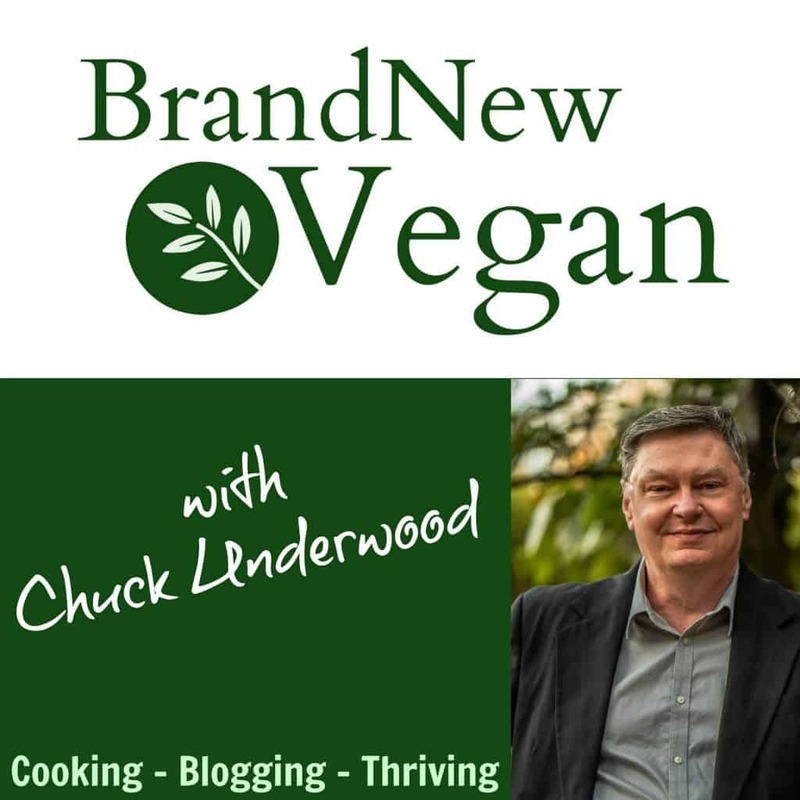 Thanks for letting us know what brands you have discovered that are compliant with WFPB WOE. It was an oil-free French Baguette I found at Whole Foods. My wife is curios as to the ‘shelf life on the Tofu Remoulade. Or do you have leftovers? Did not have any leftovers – sorry. I would say though no more than 3-5 days in the fridge. Super delicious!!! One of our favorite go to meals now! Finally (!) made this and was definitely not disappointed. I’ll be making it again. Thanks for another delicious recipe, Chuck.